Just a bit before midnight. As those that have suffered great loss always do. Something woke me from my sleep. The house a bit stiller. I got up quickly from the bed and tip-toed to the bathroom, praying… just as I once did on Christmas mornings… that I would get my wish and find the thing I wanted most… but she was gone. Still elegant in her death. Her long rusty red and white tipped neck draped gently over her towel laden bed, as if she had only fallen asleep, and in the morning, would be mine to love once again. She sits now, next to me, wrapped in her burial blanket, waiting to be laid in the ground, and I think of how only a few hours ago she was staring me down in a way that only chickens can, accusing me of being selfish. I had tried to care for her on my own, but feeling that I had done it all wrong, and worried that I had waited too long, I took her in to the vet, hoping he could save her but fearing the worst. He walked in and smiled at her… reached out and brushed her soft feathers. He said she was the sweetest bird he had ever met and then… that she was the thinnest chicken he had ever seen. And though he meant it without judgement, I felt a failure in the way of a parent, that I had let my child down… so sure in my ego that I could give her better care at home… and now feeling as if I was a Judas who betrayed her trust… had brought her to be put down in the company of strangers. I’ll do anything to save her. I”ll do it all differently this time. And so the doctor left the room to get her fluids, and food, and the medicine she would need. He made no promises but said that we would give it our best shot. “Our best shot,” I whispered to Matilda after he left so pleased that we even had a shot. It was always so with Matilda. 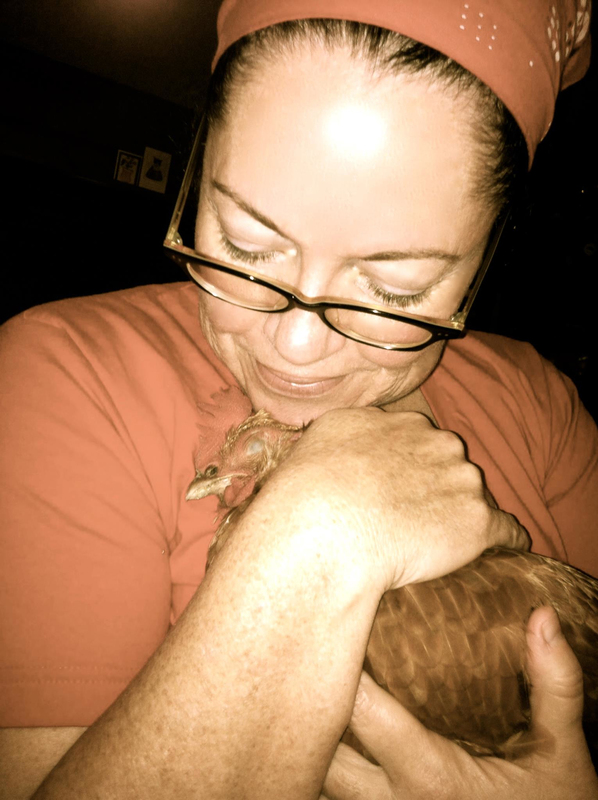 There was always something that was more human than chicken about her. The way she first found me that night in the park. Popping out to say hello, sure that I would take her home before the coyotes got to her. The way she would hear my mini-van pull up and run wildly pell-mell to the fence, so excited to see me. The way she would hunker down, preparing for me to pick her up… as if she had positioned herself for freeze tag… before I would scoop her into my arms and hold her close while she cooed and cooed, eyes closed… sure in my love for her. But do you ever see the things that you’ve done right when you are in the middle of a loss? I don’t think that you do. I think that you cry… you beg… you ask for a take back… and you say. Hoping that you can somehow stop death in its tracks… and find a way to hold tight to those that you love. Beautifully written. So sorry for your loss. You captured it. The loss we all feel. Just beautiful. Thank you, Sara… miss my girl, Matilda. And miss you too! Hope you are conquering the world! xo D.
But sorry you had to write that. Thank you, Karen. xo D.
After reading this – I’m crying for both you and Matilda and I’ve definitely lost my appetite for chicken (my vegetarian son would like hearing that!). Honestly, I wish “being good” could help us escape death. Loss is so “punishing” to our heart and especially someone with a big heart like you. Please accept my condolences on your loss. Thank you, Judy. She was a great pet… very magical… after all of my great losses in life, death and divorce, it is the pets that always healed my heart and made me want to love again. D.
I believe the theme of feeling love again is huge and I was working on a song about it this week. Of course, I am not yet ready to imagine romantic love after being with the same man for over 30 years – but truly love begins with ourselves. I feel grateful to have freed myself to live my dreams and although I don’t have pets at the moment, I know how special that love can be. I am very sad about Matilda. She had a special pipeline to your heart and soul. I’ll look forward to sharing my new song with you soon. D. D. My heart aches for you. What a beautiful relationship the two of you had. One could only be so blessed to me loved and taken in by you. Being an animal lover / owner of so many kinds of pets myself over the years (including a monkey) I really do know how you are feeling. Sending big hugs and love to you. Thank you so much, Sonya. xoxoxox D.
I can’t wait to hear your new song, Judy! D.
It has been a few days now since you lost your friend. Wishing you a peaceful weekend ahead. Thanks for you powerful words.